denmark | "Name On The Trophy"
With the World Cup three days old I finally managed to bag myself a ticket for the Holland – Denmark game. One of the tutors working on the newsroom had a spare ticket – for 14 quid no less!- so I thought it only polite to join her and her two mates for the match at Soccer City. Despite one of our party being a Leeds fan- had I known this I’d never have gone, in fact I’d have told her to stick her ticket up her sheep bothering mate’s *rse- we actually put rivalry aside and remained civil. We got a park and ride bus from Wits University, where it became obvious from the start that this was going to be like a Netherlands home game. The majority of white South Africans are descended from the Dutch so it was literally a case of spot the non-orange shirt as we made the shirt journey to the stadium. Arriving at Soccer City, it was at least five minutes before I finally spotted some Danish fans, playfully headlocking an elderly Dutch fan as strangers took pictures. The stadium itself reminded me of the spaceship from Close Encounters of the Third Kind and even more impressive was the amount of truly stunning supporters from both sets of fans. After getting through the first barrier, which doesn’t get you into the stadium, but into the surrounding area, it was amazing to see so many fans from both countries, getting along so well. The Dutch may have outnumbered the Danes by at least 10 to 1 but it really didn’t matter, as fans were mingling, hugging and having a whale of a time with no signs of malice or antagonism. I’d managed to dig out an old three stripe orange t-shirt, purely to fit in a bit rather than having any preference and as I wandered around with the members of my group it amazed me just how well everyone was getting on. I’ve never seen this sort of atmosphere at a football match before, it was heart-warming as fans from both set of teams took photos with each other and joined in with one another’s singing. 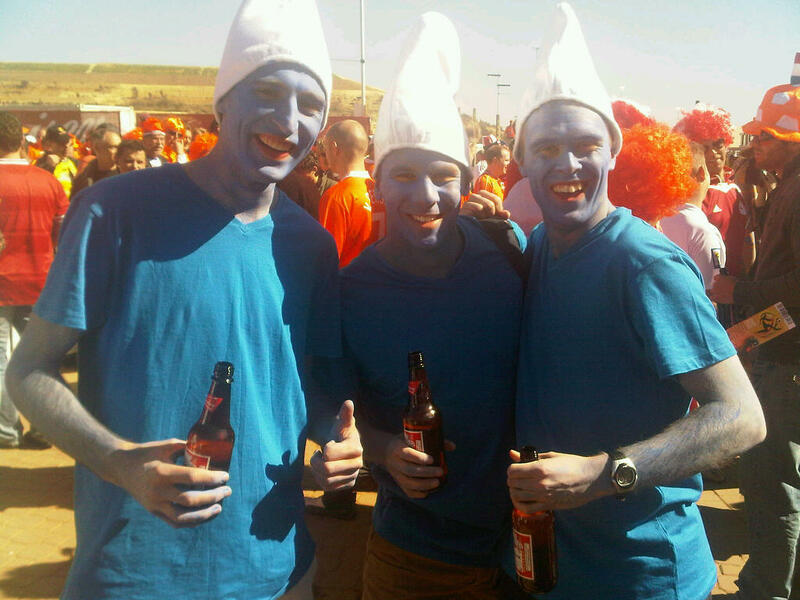 The weather also added to the occasion as it was getting quite hot, and as the Budweiser flowed- it’s the only beer sold at stadiums due to FIFA sponsorship, fans in an assortment of wacky outfits mingled cheerfully in the epitome of World Cup spirit. There were even fans from other nations getting involved, I saw several Argentine fans, not to mention Mexico and Slovenia, there was even a Stoke City fan?! I spotted a lad in an England shirt who was posing with a bloke in a Germany shirt, this was almost a bridge too far, what on earth was happening? I spoke to the craziest England fan I’ve ever met and asked him what the f*ck he was playing at. Amazing. It’s enough to make Winston turn in his grave. It’s a ridiculously friendly atmosphere which has been the story of my stay here so far. 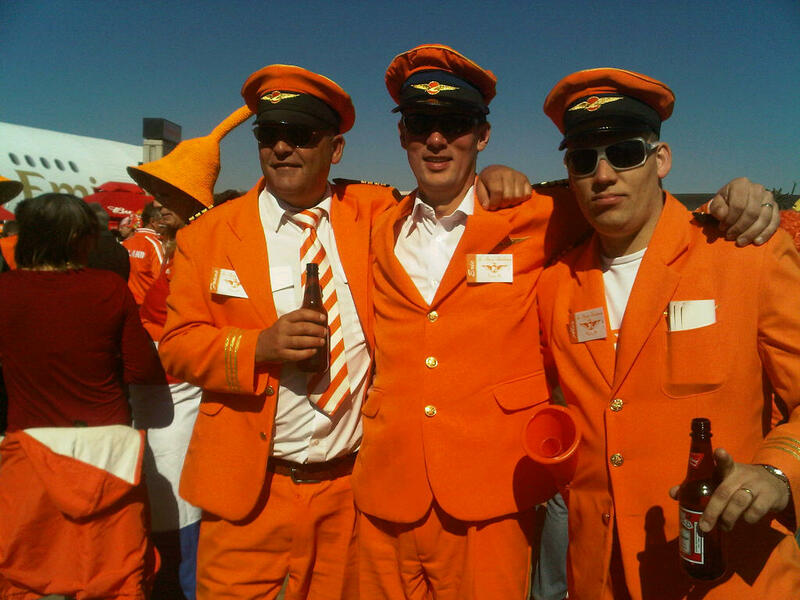 Fans from around the world getting along, in the true South African spirit. After entering the stadium I realised I needed to use a cash machine so joined a queue to wait and draw some money out. The line seemed to be made up entirely of Americans all waxing lyrical about the South African hospitality. By the time we made our way to our seats the national anthems were in full swing- although to be honest I couldn’t tell you which one was first. The stadium was like a sea of oran…..erm, tangerine, sorry but I promised I wouldn’t use that term. Around one in ten seats was empty but just to compound the Danes sense of being outnumbered the seats were orange coloured. 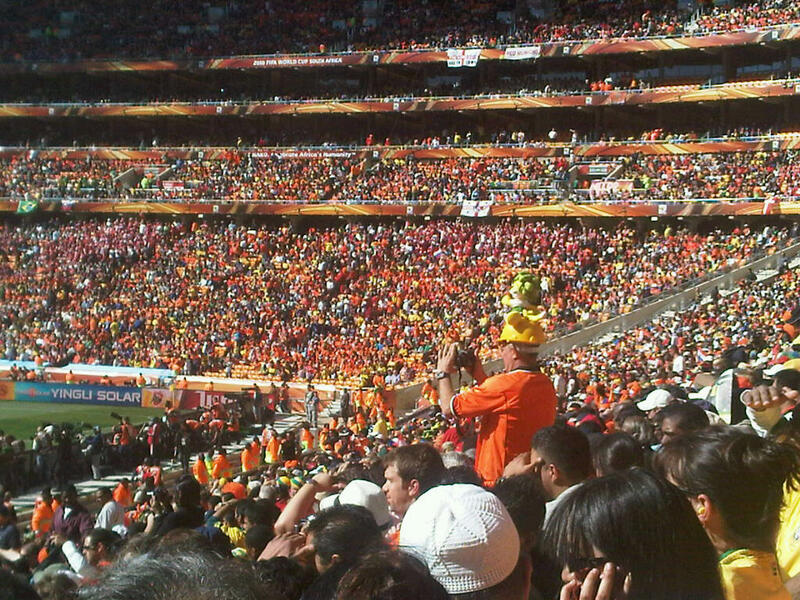 After admiring Dirk Kuyt’s new haircut, I took in the crowd, which was a mad mix of vuvu blowing locals, Afrikaans and the occasional section of Danes. Soccer City - what a dump. We were sat among a few hundred local school kids who’d been given tickets by Sony and Coke as part of an award scheme. It was truly an awe-inspiring sight seeing so many local African children blowing their vuvu’s and laughing and singing as the game progressed. The strange thing about the match was not Holland’s 2-0 victory which was fairly predictable, but it was the only game I’ve attended which was bereft of any chanting. There was lots of vuvuzela blowing and clapping but no real chants. Not necessarily a bad thing, just a bit strange compared to what I’m used to. Looking around the magnificent stadium I spotted a few England flags hung over the middle barriers, one said “Stockport Blues”- typical.